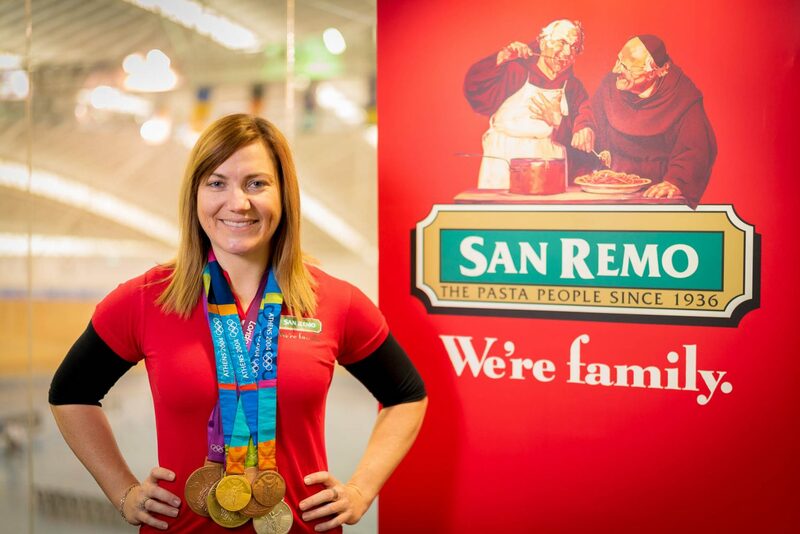 On a mission to give Australians permission to enjoy pasta more often, Australian track cycling champion and sporting hero, Anna Meares has teamed up with Australian pasta brand San Remo. The role sees the Olympic, World and Commonwealth Games champion join forces with fellow athletes swimming champion Kyle Chalmers, and Queensland Firebirds Netballer Gabi Simpson as San Remo ambassadors. “Pasta has always been a go-to for me – from times of intense training when I raced competitively through to now when my racing days are behind me – it provides such a great source of energy for the body with appropriate portion control,” says Anna. “In the world of competitive sport, reaching your peak and performing at your best is the result of organisation, preparation and working hard. You also have to eat the right food every day to get through your workload of training, practice, and planning. While her competitive racing days are over, Anna still lives by those words today. “My daily life now is really busy and varied – I’m travelling, presenting to audiences, and hosting events – and I still need nutritious food that gives me the right energy and keeps me feeling full. “While Lasagna and Spaghetti Bolognaise are some of my favourite dinner time options, what I love most about pasta is that it also works brilliantly as a side dish or as a convenient lunch time option. There is a pumpkin and chicken pasta salad recipe I learnt to make in high school which is perfect for just those occasions,” says Anna. Dietitian and nutrition expert Joel Feren, is also a big pasta fan and points out that pasta is a great source of nutrients and energy for all Australians. “Dietitians like myself have been singing the praises of pasta for years. It provides a number of important nutrients including low GI carbs for sustained energy, B vitamins, folate and iron,” says Joel. San Remo is a 100 percent Australian family-owned business that has been making pasta locally in Adelaide since 1936. San Remo is proud to be the longstanding number one* dry pasta brand in Australia. San Remo’s Durum Wheat Mill is one of the largest and most sophisticated in the Australia/South East Asian region. De-skin and chop the butternut pumpkin into small pieces. Toss in small amount of olive oil and place on oven tray topped with salt and pepper to taste. Place in oven at 180 degrees and cook until soft and slightly golden. Remove chicken skin and pull or cut into thin strips. You can use a bought BBQ chicken or roast a chicken yourself. Boil pasta with pinch of salt until al dente, then drain and rinse with cold water to stop the pasta from cooking further. Tip pasta into a large bowl and toss with a mix of olive oil and lemon juice. Now add the chicken strips and spinach and toss. Cut some of the baby Roma tomatoes in half and leave some whole, then add to the pasta, chicken and spinach. When pumpkin is soft and slightly golden to the bowl of mixed ingredients and toss all together. Finally, pan roast some pine nuts to top salad. Serves 4-6 people for a main meal or side dish, and a winner at family barbecues. Pasta is a wholesome food that provides a number of vital nutrients. It is a key pillar of the Mediterranean Diet. And rightly so, pasta should be embraced as a key staple in the diets of all Australians. Pasta provides a number of essential nutrients including low GI carbs for sustained energy, B vitamins, folate and iron. Further, those varieties made with whole wheat or legumes deliver additional protein, fibre, magnesium and vitamin E. It’s pretty super! Pasta is not only delicious, but it is a nutritional standout that can be enjoyed by the whole family. Pasta provides a range of important nutrients that help to boost mood, energy levels and muscle function as well as improve our gut health. Feeding your family pasta is something every parent can be proud of. The new range of San Remo Pulse Pasta gets this dietitian’s tick of approval. The combination of lentils, chickpeas, borlotti beans and peas adds additional fibre and protein plus a host of other nutrients. You can combine it with pesto and sundried tomatoes plus a side of veggies or salad for a nutritious and delicious meal. Anyone can enjoy pasta as part of a balanced diet. Including a serve of pasta with a serve of protein and vegetables will ensure your meal is nutritionally balanced.